Mirror's Edge is one of those titles that I absolutely want to love. I've been a huge fan of the concept since it was first announced, and the fact that it's a game that is actually trying to do something (relatively) new amidst a sea of sequels and knockoffs already gives it a number of points in My Bookâ„¢. If the game turns out to be an exceptional smash hit and instant classic, you would certainly count me in with the rest of the elated masses. That said ... while I absolutely adore the concept, I'm all too aware that there are countless ways for Mirror's Edge to fail horribly in its execution thereof. So I couldn't help but feel a strange sense of anxiety when I took the controller for the PAX '08 Mirror's Edge demo in my hands, ready to put myself in the shoes of main character Faith and see for myself how well the concept held up in playable form. As it turns out, it held up surprisingly well. After a few clunky moments familiarizing myself with the controls at the beginning, I found that the game handled very intuitively, even on the admittedly-unfamiliar PS3 controller. Movement felt fluid and natural - as one would hope from a game centered around free-running - and there were moments where I found myself executing a maneuver and then pausing after the fact to look at the controller to figure out exactly how I'd done it. The "Runner Vision" system works very well - as an experienced Runner, Faith automatically notices potential routes that are highlighted in a vibrant red. The red stands out extremely well against the stark dystopian white of the Mirror's Edge futuristic authoritarian metropolis. It's obvious without being obtrusive, and I never found myself standing still trying to find a route for more than a few seconds. Mirror's Edge is very solid visually, even if it isn't pushing any particular technical boundaries. Its aforementioned use of color deserves another mention, because that's one of the things that I came away from my time with the demo being the most impressed with - both as a subtle guide for the player as well as a great way to flesh out the emotion and atmosphere of the setting. One of my major concerns with the game had been with the first-person perspective and how well it would work in what was essentially an evolved platformer title on steroids. I'm still not entirely sold on the idea - I did misjudge the distance of a few jumps and plummet painfully to my demise - but it works surprisingly well, and the game does a tremendously good job at actually giving Faith's body a solid "presence" and sense of movement and momentum. For instance, when you slide under railings you get a glimpse of your legs and feet in front of you - I never really felt that I was controlling a floating camera instead of a Runner. Combat isn't as robust as the movement, which isn't really surprising given that it's simply not the focus of the game. All of the enemies I encountered in the demo could be dispatched with the press of a single "Disarm" button, and while I could take their weaponry, Mirror's Edge isn't meant to be a FPS and doesn't play well like one. Combat is best avoided rather than rushed into. The completely minimalist - practically nonexistent - HUD works well in practice, though it took a short while to get accustomed to. As Faith gets injured, the screen darkens and wavers (though she recovers quickly), and larger falls will instantly kill her. I still think Mirror's Edge is a damn cool idea, and the game felt solid given my limited time with it. While my concerns over how well the ideas will translate to gameplay have been mostly assuaged, I'm not sure how they'll pan out over the length of a multi-hour game. The game didn't get repetitive or tedious in my fifteen-minute demo; whether or not I'll feel that way after six hours of gameplay is another challenge entirely. If DICE can keep the game fresh and hammer out some of the existing kinks, they might very well have a potential gem here in Mirror's Edge. 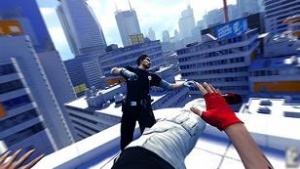 For now, I'm being optimistic - but cautious - and I'll keep my fingers crossed that Mirror's Edge ends up being the game it has the potential to be.